Photo booth hire in Melbourne can lead to interesting times, hilarious photos and wonderful memories. Add a bit of excitement and laughter to any event by calling in our services, available all across the region. We’ve been around since 2013, providing the best and affordable, awesome booths to weddings, parties, corporate gatherings and a number of other events. We don’t just have any old photo booth! We have open style booths that can pack up to 15 people in one shot. You can gather all you friends for that one, perfect photograph that would last you a lifetime. Why choose us for your next party booth hire? We have the best studio quality equipment and lighting available. You’ll always get the highest quality photographs in the industry from us. Whether your intention is to bring a little spice to your party, add playfulness to a boring corporate event or have memorable and unique photographs of your wedding, we can help. We use a number of interesting professional techniques to produce stunning pictures! We also take steps to ensure each and every one of your guests looks good in their photograph. 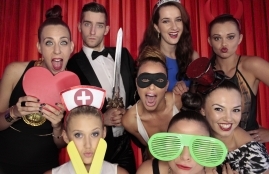 Our affordable photo booth hire in Melbourne automatically adjusts the quality of the images. You can be sure that no photograph comes out blurry, unfocused or overexposed. Our software also automatically retouches the photos so that all your guests look great and glamorous. In our 3 years of existence, we’ve handled over hundreds of jobs at several different events, bringing fun with us wherever we went! While it’s our aim that you have the time of your life in our photo booth rentals, you can expect the best, most professional service from our people. In fact, our work’s been good enough to draw the approval of the Australian Bridal Service Association. We’ve been accredited and audited by them so you can trust that we’re the best in our field of work. Don’t hesitate to bring some of our excitement to your next event! Our team would make sure that your day is very memorable! For more information on cheap photo booth hire and mirror photobooth in Melbourne, please get in touch with one of our friendly and informative team. Call 0421 786 963 or email info@awesomephotobooths.com.au We’ll get back to you as soon as we can.We’ll get back to you as soon as we can. With Awesome Photo Booth, you have the option of whether you prefer an open or enclosed style, depending on the type of venue. We have made ordering easy, creating awesome package deals according to the amount of time you need to rent out our services. Some of the ‘Awesome’ package inclusions include booth assistant, customised text on photos, choice of color and black/white photos for each print, black A5 sized guest book, prop box, black or red backdrop, and unlimited booth use and pre-cut photo strips. Portable, clean, handicap friendly, and affordable pricing, we go above and beyond the standard. Every moment should be captured and a photo booth can only be in one place at one time. We want you to get the most out of your event; this is why we provide friendly, experienced, and dependable roaming photographers to make the rounds at your venue. A roaming photographer’s sole responsibility is to strategically meander throughout your event and take snapshots of all those epic moments the photo booth can’t. Whether it is for a wedding, work event, or birthday party, too many memories have the potential to go undocumented, but our roaming photographers vow to make you feel like a rock star by capturing all the best sides of your special occasion. Not too sure about only having the option between a black or red backdrop for your photo booth? We make sure to provide you with as many options as possible, which is why we have dedicated a lot of time and effort into developing our flower backdrops. A recurring theme at all events are flowers, so in order to best accommodate you, we have developed a multitude of flower backdrops. With a seemingly endless supply, we guarantee to provide you with a wonderful flower backdrop that will pair perfectly with the event you are hosting. Whether it is a particular flower that you are searching for to match a wedding, a specific type of seasonal bloom for a birthday party, or a significant blossom for a baby shower, we guarantee to find the perfect backdrop for your customised photo booth. A trend that is sure to catch fire, Instagram Printers are all the rage at events, so we make sure to provide you with these! What is the concept of an Instagram printer? These special printers will be programmed with a hashtag or location of the event coordinator’s choosing and then connected to an Internet source. It then has the opportunity to link up with Instagram and searches for the programmed hashtag or location. As it finds these photos, it will then print them out. Essentially, this replaces the old ‘disposable camera on the table’ trend that has been a popular feature at events, and instead, provides you with instant memories that are sure to last a lifetime. Awesome Photo Booth in Melbourne has come to specialise in wedding photo booth hire, making the process unbelievably easy, cool, and unique to every wedding we do. You have the option to customise your cheap photo booth hire to your exact specifications whether it be the backdrop, wording on the photos (wedding dates, bride and groom names, etc), guestbook, and the type of pictures that print out for guests (black and white or color). Even better, your guests are guaranteed to pile into the space and try on a wide array of props from our prop box, meaning you and your guests will be left with a lifetime supply of laughs and memories from the most special day of your life. Thank you thank you to you Kevin & Monica. You were always both very professional and always contactable. We had the most awesome night with the photo booth it was fun fun fun. Your booth took exceptional photos we had the time of our lives at my daughters 21st birthday party. I would absolutely recommend you to anyone! The venue staff commented how professional and you took care with taking the unit up the stairs.